These models were created with the generous support of my patrons on Patreon. 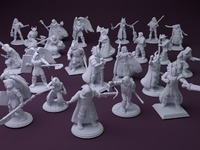 You can join the fun at https://www.patreon.com/sablebadger to get advance access, free models, and support a quickly growing collection of tabletop models. Higher tiers can also participate in polling, and suggest future projects. Introducing Tilestone Stackers. I have developed a style over time for my dungeon stuff, and I've given it a name "Tilestone". These stacker blocks came out of a previous project to make more fantasy wargaming tabletop terrain, but I decided to extend the line by a request from DM Jim on one of his videos that featured the previous designs. To give credit where it's due, the original concept of a "stacker" bit of terrain I got from Black Magic Craft on one of his excellent videos. To the base square block, and stair designs I've added half width rectangles, mid-height blocks, and some wedge shapes to create curves in 45 and 90 degrees. You can use these basic shaped blocks in lots of different ways to quickly create different tabletop layouts for games like Frostgrave, Mordhiem, Rangers of Shadow Deep, and others. They are pretty simple to paint with a grey prime base coat and sponge on two different grays. You can also add a black wash to grunge it up. Update: Added some roof "wedges" to create different house styles depending on your need. 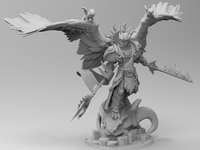 I have quite a few models available for table wargaming, just check below. I put a lot of time into making these models, so if you're inclined a TIP wouldn't hurt.